Impact Wrestling Hall of Famer Abyss and former WWE superstar Matt Striker coming to Long Island! Subject: LongIsland.com - Your Name sent you Event details of "Impact Wrestling Hall of Famer Abyss and former WWE superstar Matt Striker coming to Long Island!" Full Faith Wrestling’s February 9th, 2019 event like all our events are a fun family friendly night of wrestling and sports entertainment for only $15 a ticket where you can come be entertained and simultaneously give back to your community. 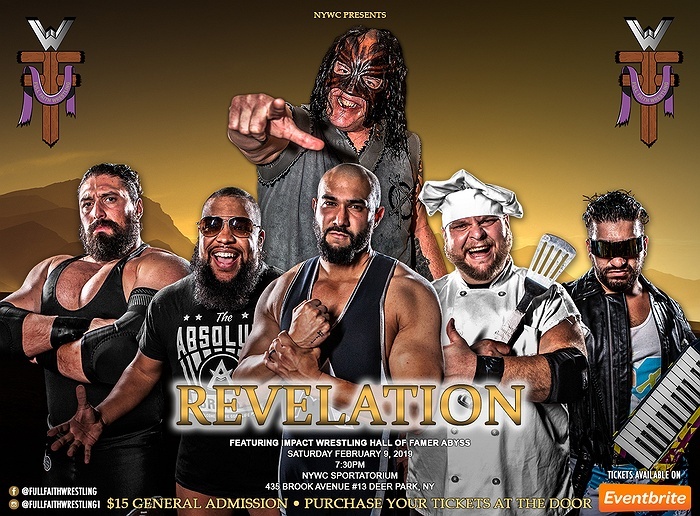 FFW presents “Revelation”, will be held at the NYWC Sportatorium 435 unit 13 Brook Ave, Deer Park NY. Doors will open at 7:00 PM sharp and Bell Time is 7:30 PM. Featuring Impact Wrestling Hall of Famer Abyss and Former WWE superstar Matt Striker! We are on Instagram @fullfaithwrestling1 FaceBook FullFaithWrestling and Twitter @FFWFaithful, our website is www.FullFaithWrestling.com. I greatly appreciate your very valuable time and consideration to cover our organization and up coming event.